This title – Wrapped – may come as a bit of a surprise to many readers. After an even more than usually intensive period spent with sweets, I craved savouries and threw myself wholeheartedly into wraps, crêpes, rolls and other delicious titbits. The book has just been released in the UK (Pavilion). The American edition (Interlink) will be published in July. I have been asked what the difference is between the two editions. The recipe content, text and photography are identical. 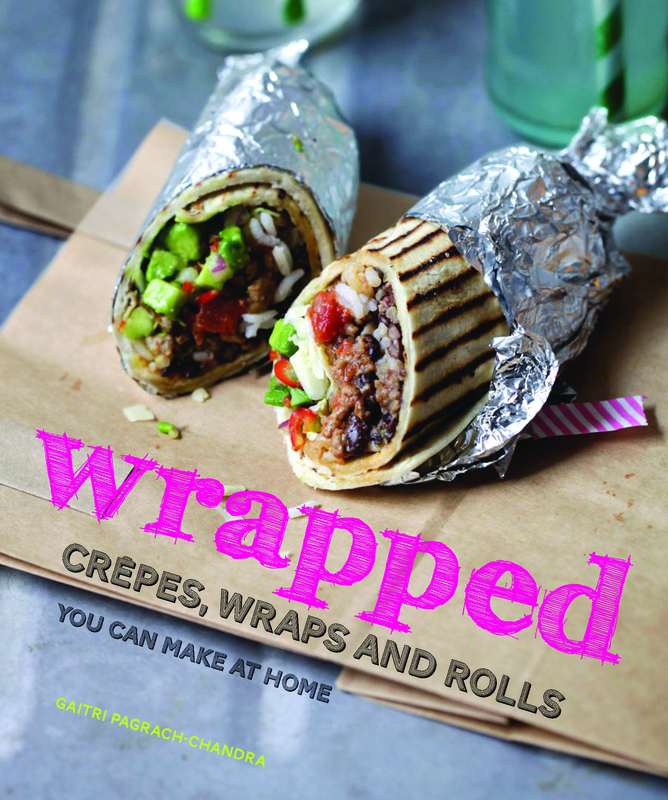 The cover of the UK edition bears the subtitle ‘Crêpes, wraps and rolls you can make at home’, while the US one says ‘Crêpes, wraps and rolls from around the world’. The two editions use the spelling that is common to their regions. The only significant difference is in the MEASUREMENTS. This time, both publishers have chosen to use only the measurements specific to their area. The UK edition has metric weights and measures, with small units in teaspoons and tablespoons. The US edition contains volume measurements, with weights in pounds and ounces; small units are given here too in teaspoons and tablespoons. “Wrap! Roll! Eat! A delicious collection of world food recipes from the award-winning author of Warm Bread and Honey Cake. ‘Before you start’ is an introduction to the book. Tired of generic shop-bought, preservative-stuffed tortillas? This chapter gives you all kinds of ‘wrappers’, such as flour tortillas with variations, a few kinds of Indian roti, pitta or pocket bread, butter flaps/coco bread, fried bread, basic dough and pastry for frying, and more. Fresh self-assembled spring rolls, Filipino style, anyone? Or perhaps crystal rolls with rice paper wrappers? Or what about Beef Bulgogi from Korea? Hard to please? Let’s stay Asian for a while yet: Teriyaki Salmon, Minced Chicken Satays, Tandoori Chicken Skewers or Paratha Egg Sandwich, then? Let’s travel westwards and pick up some chicken shawarma, or if you prefer, a version with lamb. Then we meet Kebabs and Souvlaki. Hopping over to North Africa, Chicken Chermoula skewers, and then across the Atlantic for a Philly Cheese Steak wrap. Would the book be complete without Burritos, Chimichangas, Fajitas, Tacos and Taquitos? Of course not. And we must visit my homeland Guyana, for Chicken Curry and Roti. Stop off in Jamaica on the way for Jerk Chicken, if you like. Jamaican Beef patties, Indonesian Pasties, Crisp and Spicy Martabak Packets, traditional Spring Rolls, Vegetable Samosas, Steamed Buns, Potsticker dumplings, Caribbean favourite Bake & Saltfish and more to tempt you. Here again we scour the world for the most delicious titbits: Asian and Caribbean Fish cakes, Prawn Fritters, Falafel, various types of vegetable fritters and cakes and one I made up: Salmon Patties with a dressing of mushy peas. Try it! Sizzling Vietnamese pancakes with delicious fillings, no-need-to-ferment dosas, French chickpea crêpes and galettes, Latin American Arepas with Reina Pepiada stuffing, and more treats for you. Now here’s a chapter I really enjoyed putting together and trying out in various combinations. There are fresh and cooked tomato salsas, Mango Salsa, Guacamole of course, Hot, Sweet & Sour Indonesian Fruit Salad, Peruvian Onion Relish, Chutneys made from mangoes, cucumbers or coconut, a Kimchi-style pickle, Peanut Sauce, Garlic Sauce, Tamarind Sauce, Yoghurt Sauce and of course a few dipping sauces, among others. Use them as you like to add more bursts of flavour to your wraps and snacks. I know you would be very put out if I didn’t offer you some sweets, so here they are: Walnut Cream Crêpes, Chocolate-filled Roulade, Apple Turnovers, Crêpes Suzette, Sponge Pancakes with ricotta and pistachios, a filo delicacy too, of course, Walnut and Cinnamon Griddle Cakes from Korea and Banana Spring Rolls from the Philippines, among others. Gaitri is an international food writer whose enthusiasm for global cookery lifts you out of your armchair and sends you travelling across the world through recipes, tastes and flavour combinations. From Mexican flour tortillas, to Guyanese butter flaps, Middle Eastern pitta breads, Indian roti, Chinese spring rolls and French crepes, this book is a valuable, informative resource that teaches you the basics to create a diverse and versatile range of wraps. ... an ideal gift for all those home cooks who are after different, exciting, frugal recipes to take them out of the familiar, tried-and-tested snacks, canapes and food-on-the-go repertoire they might have in their day-to-day armoury. Wrap! Roll! Eat! rally the imperatives on the back cover. And you will want to do all three. Get ready to wrap it up. No matter what you’re craving, Wrapped has just the recipe to hit the spot. Whether you prefer homey or exotic, it’s covered. There are 80 recipes for everything from crepes, tacos, and spring rolls to dosa, kebabs and more. The great-tasting, easy-to-prepare dishes are perfect for both new and experienced cooks alike. And there are plenty of photos to tempt you in your wrapped food creation. It's definitely hard to resist something wrapped in something else - recipes for the portable and the exotic. Most of the recipes are eclectic and ethnically inspired handhelds, perfect for on-the-go lunches or picnics at the lake. Crepes, empanadas, burritos, spring rolls, dumplings, samosas—we’d be hard pressed to find a culture that doesn’t have a killer “wrapped” recipe as part of its repertoire. And we’d be even harder pressed to find a wrapped recipe we didn’t like. It’s year-round comfort food, right? Fillings are easily adapted to what you have on hand and what’s in season, whether there are snowdrifts outside your windows, or the drone of the air conditioner is both deafening and absolutely vital. Thankfully, Gaitri Pagrach-Chandra shares our enthusiasm. Wrapped is chock full of recipes from around the globe–Jamaican Beef Patties, anyone?– so you can make (and devour) the very best wrapped recipes without having to track down the nearest food truck. No trip to Jamaica on the calendar? No worries, you can eat like a local without leaving your own kitchen.